Reach the evacuation point before time runs out. Halopedia has a walkthrough guide to this level, The Halo Experience Showcase. See The Halo Experience Showcase/Walkthrough. "The Horizon Tech Team just found a training program buried deep within the software of an M12S Warthog CST. Seems like some kind of evacuation exercise!" 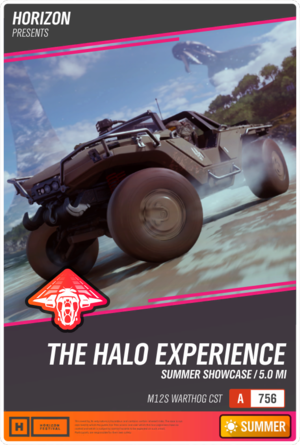 The Halo Experience Showcase is a Showcase Event in the 2018 racing game Forza Horizon 4, developed by Playground Games. This Showcase Event, set in the Summer season, is a 5.0 mi (8.0 km) long Cross Country route, represented by the icon of the front of a D79-TC Pelican. Unlocking it requires the player to qualify for the Horizon Roster, which means the player must accumulate 285,000 Global Influence (Level 20). The event's starting point is located on the Bamburgh Castle Beach, north of the Bamburgh Castle and immediately to the left to the Bamburgh Beach Drag Strip. Once the player has completed the event, they will gain access to a time-limited Winter-themed Showcase Remix variant, called Assault on the Control Room, available in the Series 7 update from March 28, 2019 14:30:00 GMT to April 4, 2019 14:29:59 GMT. This version of the event features an Urban-colored M12S Warthog CST instead of the default-colored one. Completing it during the time it was available would unlock a Super Wheelspin as a one-time reward and add 6%/7% to the Series 7 Horizon Winter Season Playlist. Immediately after Rebecca Dawson introduces the player to the Horizon Drag Strip, the map moves to the Bamburgh Castle Beach, and the icon for the event, shown as the front of a D79-TC Pelican, is placed on it. Cortana: "Chief! I need you! Hurry. We've got to get out of here." The camera pans around the player's current vehicle in a clockwise motion. The player can choose to do the event solo, cooperatively, or as part of Rivals. The player makes their choice. If the event is played for the very first time. 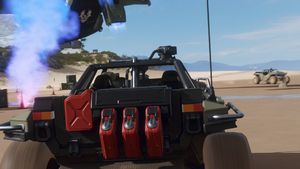 Cortana: "Initializing UNSC Training Protocol 165F-D."
An M12S Warthog CST appears, with the player's character performing an emote near the driver's side of it. The camera rotates clockwise around the Warthog and focuses on its front right wheel. Only the Warthog is now seen alongside a few UNSC crates used during the Fall of Reach with health packs and a disabled fusion core next to them. John-117 turns around to see a Pelican, with his vehicle behind him. A SPARTAN-II clad in modified GEN2 MJOLNIR Mark VI armor is seen walking towards the Warthog, with the camera changing to show him from the front. The Spartan is revealed to be none other than John-117. He stops walking and briefly observes his vehicle. John then turns around to see a D79-TC Pelican touch down in front of him and walks back to his Warthog while still facing the Pelican. Unintelligible radio chatter is then heard. The camera cuts back to the front of the Warthog for several seconds, and the environment is changed to show the Bamburgh Castle Beach during a minimally cloudy afternoon, with a Halo ring in the background. John is seen relaxing and idling by the driver's side of his Warthog. If the Winter Showcase Remix version is played. Cortana: "With the ongoing and evolving threat posed by an increasingly focused Covenant, all front line UNSC personnel are expected to complete the following training exercise. Upon completion of the training exercise, please submit results to UNSC Fleetcom for assessment." John drives the Warthog through the beach towards the first checkpoint, which is close to the Bamburgh Castle. Kilo: "This is Kilo Actual. Cortana, do you read me? I heard you need a pickup." If Streamer Mode is disabled and the Radio is on. As John gets closer to the first checkpoint, which is marked by a pair of blue signal flares, the player assumes control. Indestructible Covenant props and shield generators litter the surroundings while a pair of Banshees fly through the sky and pursue the Pelican, which is flying towards the landing zone on the beach and trying to evade the Banshees, neither of which attack. John follows the Pelican to the landing zone while being pursued by Banshees. Cortana: "Cortana to Kilo Actual. Perfect timing! We are all done here and ready for dust-off." The Master Chief makes a right and clears the first checkpoint. He turns left and notices blue race barriers made out of hard light. He sees the second checkpoint, which is marked on a ramp made out of sand. Kilo: "Whoa! Aborting pickup. Sorry, Cortana, I gotta shake these bogeys." Cortana: "Affirmative, Kilo Actual. I'll scan for a new LZ. Chief, gun it. Get us outta here!" If the Chief makes a hard crash anytime during the event, or if someone crashes into him. Cortana: "Hey! Keep your head down! There's two of us in there now!" The Chief clears the gap and jumps onto the grassy terrain part of the Bamburgh Castle. The path is now surrounded by hard light barriers again, this time on both sides. Chief cuts through a narrow castle entrance and sees that the castle has been decorated with UNSC and Covenant props. Kilo: "Cortana, what is this place?" Cortana: "I don't know. Looks like a fortification of some kind, but it hasn't been used in centuries." John exits the castle through another passageway and sees a Marine named Banks escaping to the landing zone in another Warthog. He turns right to reach the third checkpoint. Banks: "Is that a Spartan?! We're gonna make it home after all!" John follows Banks's Warthog to the next checkpoint. Cortana: "OK, new LZ found. We don't have long. This ring is gonna go nuclear in three minutes, and we do not want to be here when it does. Marines, I've added coordinates to your nav. Be there for evac in three minutes." Banks: "Roger that, Cortana. Hoo-rah!" John clears the fourth checkpoint, drives through the farmlands, and reaches a checkpoint close to several residential homes. Cortana: "Look at these ancient dwellings. It almost looks like something lives here." After clearing the fifth checkpoint, John then continues to follow the Pelican and gets on a public road for the next checkpoint. He sees that it is on farmland terrain and that the roads are blocked off by UNSC scenery props on the left and Covenant props on the right. Kilo: "Just go straight up here. We've got a better chance of avoiding those Banshees offroad." John exits the splitting road and drives his Warthog through another set of farmland, making a hard right turn to pass the seventh checkpoint, which is barricaded by a single wooden fence that he breaks through with no trouble. John then jumps another public road, which is blocked off with construction signs and military props, and lands on farmland again. Another Marine named Stacker enters the scene from the trees to the left, also in a Warthog, just as John turns right for the eighth checkpoint. Noticing hard light race barriers once again, John drives to the eighth checkpoint and jumps off a ramp. Cortana: "Whoa! Banshees. Look out!" As John drives his Warthog off the ramp, the two Banshees appear and perform a loop-the-loop evasive maneuver. After some time, John eventually lands on the ground and clears the checkpoint. Kilo: "Banshees in-bound. Try and lose 'em through those trees!" John continues following the event's route, this time turning left and eventually merging onto another public road, where the ninth checkpoint is located. He clears it, while still following the Marines, and takes a left detour off the road and onto railroad tracks to evade the pursuing Banshees. Cortana: "Alert! Banshees! Fast and low!" Stacker: "Banshees! Save us, Chief!" The Chief continues on the railroads and reaches the tenth checkpoint, which eventually leads to a diagonal right turn that leads into grassland dominated by tall bushes. Covenant props are seen splattered everywhere. Cortana: "This is Cortana to all air support units. I'm sending you coordinates for an LZ. Requesting immediate evac. All air support units to the LZ." The eleventh checkpoint is ahead, situated on more farmland along with a few farmland houses. Chief reaches this checkpoint and turns his vehicle to the right to continue the event, encountering herds of sheep along the way. He once again continues following the Marines up hilly farmland to reach the twelfth checkpoint. Kilo: "Cortana, I'm getting a green from three, four... make that five Pelicans. En route to the LZ. You and the Marines had better be there soon." After passing the checkpoint, John turns left to merge onto a public road and eventually reaches a two-way highway designated M68. He takes the road on the right, which leads into a tunnel. Kilo: "Cortana, I can't follow you through here. I'll see you on the other side." Cortana: "That's not the most reassuring choice of words..."
As John drives his Warthog through the tunnel, he encounters another Marine named Navarro. He eventually enters the tunnel, which is marked by wrong way signs at the ceiling of the entrance. He then drives his Warthog through the tunnel, turning left and right to avoid Covenant military objects. Cortana: "This cave is not a natural formation..."
John approaches another ramp, jumps it, and smashes through construction signs while following Navarro. All contact has already been lost with Kilo, which is flying above the tunnels. Cortana: "I don't like this. Comms have gone quiet. Kilo Actual, do you read? Kilo Actual? Whoa!" A Banshee flies through the tunnel, doing a barrel roll. At the end of the tunnel is a ramp two lanes wide. The Chief then drives through the ramp at full speed and flies off of it. In mid-air, the Chief's Warthog makes a close call with the Pelican, which has now regained contact with the Spartan and his AI. Another Banshee flies to the left near the Pelican, the Chief, and his vehicle. Kilo: "Loud and clear, Cortana!" John drives offroad once again for the next checkpoint, which is immediately followed by a hard left turn. Another Warthog spawns in, with Chips Dubbo being the driver. Cortana: "Good to see you again, Pilot! I do not want to reach that LZ without you!" John continues following the Pelican and Marines and then turns right to reach the next checkpoint. John realizes that time is running out and brings his Warthog to full speed for the last several checkpoints up ahead, with the next one directly ahead of him on a dirt road. Cortana: "Cortana to all units, the LZ is right ahead. We have thirty seconds before the ring's superstructure begins to collapse." John, clearing this checkpoint, jumps the final ramp and above the Pelican. Another pair of Banshees fly past the Spartan and his Warthog while he gets a few seconds of air time. The Chief then lands safely, getting an "Ultimate Air" Skill. He follows the route, which then leads into a sharp left turn that leads back onto the Bamburgh Castle Beach. Cortana: "Fifteen seconds, Chief! Ten, nine, eight, seven, six..."
The penultimate checkpoint is seen, this time on the beach. John drives onto the beach, with rocks surrounding him on both sides, and clears the checkpoint. John reaches the landing zone to finish the event. Cortana: "Five, four, three, two, one... We're not gonna make it!" The final Marines, named Perez and Reynolds, spawn in Warthogs and reach the landing zone, which is near the Thatch Corner house. The finish line, marked by three pairs of blue signal flares, is seen at the landing zone up ahead. John uses full throttle to push through. Cortana: "Pilot, this would be a very good time to leave." John crosses the finish line. A blank white environment with a reflective floor appears, with military crates and traffic cones present, along with John's Warthog and the Pelican. He is seen driving out of the scene as the event's results are brought up. Cortana: "Horizon Festival training module complete. Initiating upload of results to the UNSC Fleetcom." The event ends, with John looking at a large screen detailing the player's earnings from the event, as well as a Horizon Wheelspin if available after leveling up. The event was officially unveiled in the September 2018 episode of Forza Monthly. Prior to being officially revealed, it was leaked through the internal files of the game's Windows 10 PC version. In addition, its event marker icon had earlier been spotted during the Forza Horizon 4 - Seasons Change Everything | Spring livestream on the official Forza YouTube channel. This event is highly reminiscent of the Halo: Combat Evolved mission The Silent Cartographer, as both missions involve John-117 assisting Marines on a beach situated on a Halo ring while driving a Warthog. The Winter Showcase Remix version, named Assault on the Control Room, is also based on the Halo: Combat Evolved mission Assault on the Control Room. This event is also reminiscent of the final missions of Halo: Combat Evolved and Halo 3: The Maw and Halo, respectively. All three events involve escaping a Halo ring in a Warthog (in Halo: Combat Evolved's case, Installation 04; In Halo 3's case, Installation 08; and in Forza Horizon 4's case, a currently unidentified Halo ring). The tunnel run sequence is reminiscent of the ending of the Halo 2 mission Outskirts, which also involves John using an M12 Warthog to drive through the underground tunnels of New Mombasa. The major differences between the two tunnel runs are that The Halo Experience Showcase features no combat and only nonstop driving, and that the Forza version has a much shorter tunnel run with only shallow S-bend turns and a ramp. Her line "Hey! Keep your head down! There's two of us in here now!" is derived from the Halo: Combat Evolved and Halo 3 missions The Pillar of Autumn and Cortana, respectively. Cortana's line "Alert! Banshees! Fast and low!" is a direct quote to a line from the Halo 3 mission Sierra 117. When Chief enters the highway tunnel, Cortana jokingly and confusedly comments, "This cave is not a natural formation..." This is an infamous line that was first heard in the Halo: Combat Evolved mission Halo, which coincidentally also involves driving a Warthog through an underground structure. After completing the event, Cortana says, "Pilot, this would be a very good time to leave. ", which is derived from the ending cutscene of the Halo: Combat Evolved mission The Pillar of Autumn. The Covenant and UNSC scenery props are derived from Halo: Reach. The armor used for the Marines is a combination of the Marine armor from Halo 4 and Halo 5: Guardians, using one of the helmet variants from Halo 4 with a gold visor added in and the standard body from the Halo 5: Guardians rendition of the Marines. The Banshees and Pelican are derived directly from Halo 5: Guardians. His techsuit is now colored a much darker shade of green (closer to black), and all red/olive green piping on it is now colored white. His faceplate is now fixed, much like before his violent altercation with Jameson Locke in Halo 5: Guardians. With the exception of Navarro, all of the Marines featured in the event (Banks, Stacker, Chips Dubbo, Perez, and Reynolds) have appeared in at least one Halo game. Excluding Anniversary titles of the Halo series, Forza Horizon 4 is the first appearance of these Marines (at least by name) in a video game since Halo: Reach and Halo 4. This event features a unique skybox, with a Halo ring in the background along with a CRS-class light cruiser from Halo 4 lurking among the clouds. When the event is played, "The Trials", which originates from the Halo 5: Guardians Original Soundtrack and is also included in the Timeless FM radio station, is used as the event's music. 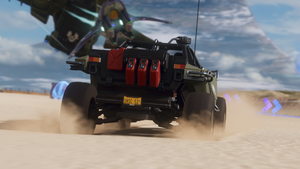 When a player plays the event, their Xbox status will read "Forza Horizon 4 - Finishing the fight in the Warthog", an obvious reference to Halo 3's marketing slogan. Like with Halo: Combat Evolved, Halo 2, and Halo 4, when this event is played in Co-Op, each player plays as an identical copy of the Chief. If the player views their replay of the event, the Banshees appear like normal, but once the player enters Photo Mode and exits it, the Banshees disappear. Cortana's line "Pilot, this would be a very good time to leave." does not have the "a" between "would be" and "very" in the in-game subtitles. This is the first Showcase Event in any of the Forza Horizon games where the player does not have to actually race against another mode of transport. In this case, the player simply has to complete the event as quickly as possible, as the player's position is never displayed in the HUD for this event unless the player plays this event on Co-Op. It is also the first Showcase Event to feature multiple AI-controlled Drivatars; in this case, Marines in Warthogs. However, while the player actually never races against them, it is possible to get behind them for Drafting skills or pass through them for Pass skills. Neither the Pelican nor the Marines are listed in the starting grid. Unlike any of the Halo games, where John speaks either in cutscenes, gameplay, or both, in Forza Horizon 4, he never speaks at all. This is the same for other selectable driver characters in the game. Forza Horizon 4 marks John-117's first full appearance in a Forza game, in contrast to Forza Motorsport 7, which features an unlockable set of Driver Gear modeled after him. It also marks Cortana's second appearance in the series, after her Forza Motorsport 4 Autovista narrations for the M12 Warthog FAV. All of the Marines' Warthogs have license plates reading "UNSC". The game does not address the individual Marines or Kilo by their actual names in the character name part of the subtitles, instead referring to each of them as simply "Marine" or "Pelican", respectively. Unlike the other Showcase Events in the game, neither Keira Harrison nor any of the other Horizon Festival characters discover the event for the player. Instead, Cortana does it. The DJs of the in-game radio stations describe the event as an "augmented reality simulator". The slow-motion cinematics do not play if the event is played as a Co-Op race or if this event is viewed in Replay mode. The map showing the event's full route. The D79-TC Pelican in the event. A Type-54 Banshee in the event. John driving his M12S Warthog. A side view of John. Note the white piping on his armor's techsuit. A Marine in an M12S Warthog. Covenant scenery props, including a shield generator and supply cases. UNSC scenery props, including M72 Mobile Barriers and basic UNSC crates. The unique skybox for the event, showing a Halo ring in the background. John-117 in an Urban-colored M12S CST following the Pelican in Assault on the Control Room. The Chief driving the Urban M12S CST onto the M68 Motorway.